Dr. William J. “Bill” Mitsch has been an Eminent Scholar and Director of Everglades Wetland Research Park, and has served as the Juliet C. Sproul Chair for Southwest Florida Habitat Restoration and Management at Florida Gulf Coast University since October 2012. He has accumulated a tremendous number of accolades during his illustrious 40-year career, and most importantly, has been a true pioneer in Ecological Engineering, and instrumental in determining wetlands and striving to protect them. Prior to his current roles, Dr. Mitsch taught at The Ohio State University for 26 years, and is now Professor Emeritus at the university, and is also Founding Director of the Olentangy River Wetland Research Park. In addition, he holds courtesy or honorary faculty appointments at University of Florida, University of Notre Dame, Tartu University (Estonia), and Nanjing Forestry University (China.) Indeed, the international scope of his work and teaching is impressive, and his main areas of expertise are Wetlands Science and Ecological Engineering. The focus of Dr. Mitsch’s research and teaching has been primarily wetland ecology and biogeochemistry, wetland creation and restoration, ecological engineering and ecosystem restoration, and ecosystem modeling. 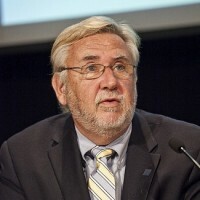 He has over 600 publications, reports, abstracts and books, including the 5th Edition of the popular textbook “Wetlands” which was completed in April 2015, and published by John Wiley, who also published his books “Ecological Engineering and Ecosystem Restoration” in 2003, and “Wetland Ecosystems” in 2009. A summary of “Wetlands” can be found here: http://www.wiley.com/WileyCDA/WileyTitle/productCd-1118676823.html. Originally, Dr. Mitsch was drawn to this field during his undergraduate studies in Engineering, when he discovered that he wanted to do something bigger and better. He recalls being part of the very first Earth Day in 1970, and early on in his career, Dr. Mitsch was actually working with the country’s biggest polluter, and he found his way into their environmental department, where he was determined to have an impact to change the course of the environment. During his studies at University of Florida, Ecology really appealed to him, and working with a world class ecologist during his Ph.D. program really sealed the deal for him. Dr. Mitsch received his Master of Engineering in Environmental Engineering, and his Ph.D. in Systems Ecology from University of Florida in 1972 and 1975, respectively, and a Bachelors in Mechanical Engineering from University of Notre Dame in 1969. In subsequent years, he has advised to completion 73 graduate students, including 23 Ph.D. students. Seventeen of his former graduate students and post-docs are currently teaching in colleges and universities in the U.S. and around the world. Dr. Mitsch serves as the Chair of the U.S. National Ramsar Committee at Ramsar Convention, an international parliament created to protect wetlands worldwide. In addition, he serves as editor-in-chief of the international journal Ecological Engineering. Dr. Mitsch also started the American Ecological Engineering Society in 2000, and belongs to the Society for Ecological Restoration International from whom he received the Theodore M. Sperry Award in 2005. He also received the Lifetime Achievement Award from the Society of Wetland Scientists in 2007. Dr. Mitsch was also awarded the Stockholm Water Prize by King Carl XVI Gustaf of Sweden in 2004, the Ramsar Convention Award for Merit in 2015, and an Einstein Professorship from the Chinese Academy of Sciences in 2010. Regarding his approach to his work and career, Dr. Mitsch adheres to the Thomas Edison quote: “Genius is one percent inspiration, ninety-nine percent perspiration.” He joined the Ramsar Committee to do something to protect the wetlands of the U.S., which was a gigantic step towards getting more wetlands designated, as currently, the U.S. only has 37 protected so far. Indeed, He thrives on the distinction and pride of getting them named. Going forward, Dr. Mitsch is interested in the benefits of branding and additional exposure, as he moved to Florida to specifically focus on getting the Everglades completed, and to have a bully pulpit. Ultimately, he wants to be branded as a one of the people who can look from afar and recognize a wetland, as he truly knows a wetland when he sees one. Furthermore, Dr. Mitsch wants to have a say and be the go-to person on how to properly restore wetlands, and will continue to teach. He cites having good grad students as helping him have more influence in the field, paving the way for future generations to continue his work. Currently, there are several movies in progress about him and his work, one in Uruguay for which they’ll be giving him an award.